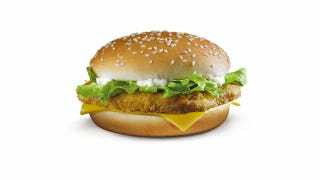 According to reports out of China, a man in Guangzhou phoned the police because he thought the Spicy McChicken he ordered was too darn spicy. After getting his food, the man sat down and took a bite. Website The Nanfang reports that the man seemed surprised by his sandwich, so he called over a McDonald's employee to take a bite. Then, supposedly, the hot-mouthed man called the police! When the police arrived, the officer tried to get the man to calm down. The McDonald's even went the extra mile, giving him a cola and some grilled chicken legs. As The Nanfang points out, most people online in China think this guy has mental problems (or maybe he just thought he ordered a regular McChicken? ), but did note that he was able to score two meals for the price of one. Don't forget internet fame—he got that, too! If you missed it, check out Kotaku's McGangBang review.